I've been trying out Speedball's new Fabric Block Printing Ink (not sponsored, I bought it from Handprinted.net with my very own pennies) and, thus far, I think it's brill. My younger brother recently moved in with his girlfriend and turned a ripe old 29, and I combined the two happy events to make one big fat present. I'd originally planned on making a printed lampshade for him and his lovely lady-friend, but then I realised that I had no idea if they even own a lamp (I would also have had to learn how to make a lampshade). I do know, however, (thanks to our mum's covert intelligence) that they bought themselves a swanky new king-size bed, so I decided that a handsome, hand-printed duvet set would go down well. 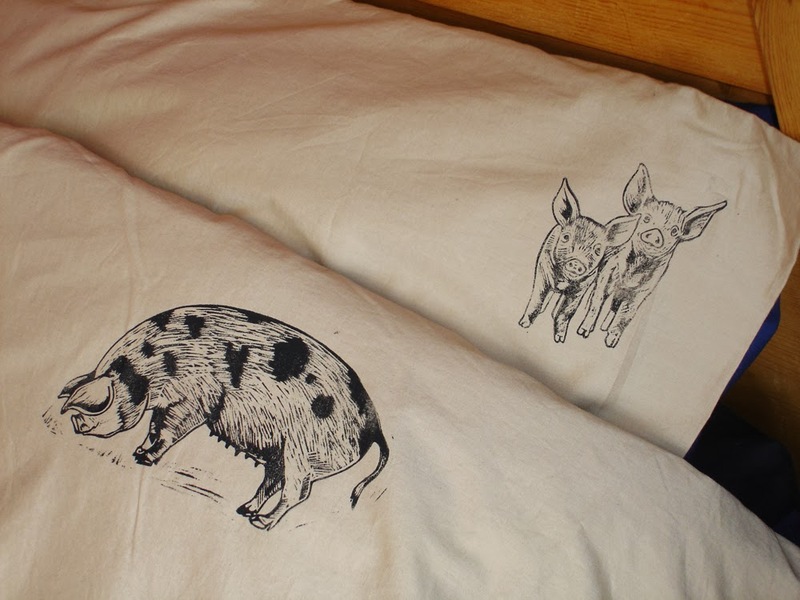 My brother's always loved pigs - he had one called Dotty when we were growing up - so a porcine theme seemed appropriate. 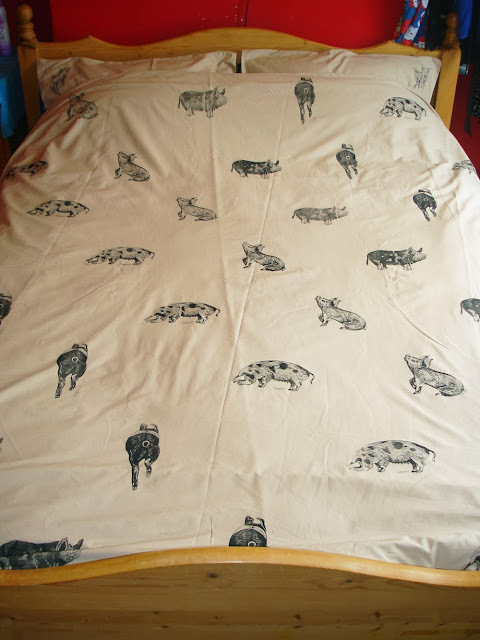 I went for a simple repeat pattern of four piggies on the duvet cover, plus a couple of little piglets for the pillow cases. 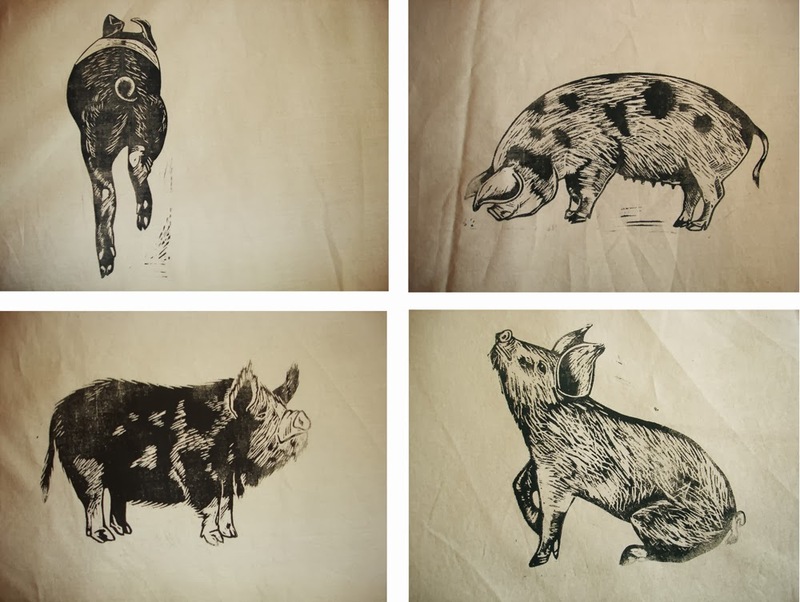 They're some of The Bro's favourite breeds; Saddleback, Gloucester Old Spot, Kune Kune and a wee Tamworth piglet. The ink took about two full days to be touch-dry, hanging on a make-shift washing line indoors, and if I hadn't already been late sending the parcel off I would have left it another day or two just to be certain. Speedball state that the ink doesn't need heat-setting like most fabric inks, but that you should give it at least a week before you do any washing. For posting I folded it up with plenty of tissue paper to make sure no residual ink messed anything up.